Clean condo, attentive cleaning staff, pleasantly surprised how well stocked with cooking utensils. It is a good hotel with a gym and swimming pool. I had a good one day stay. I would stay at this location again. Very clean, beautiful property! Staff was so helpful and i won some cash! Can't go wrong! Something for everyone at this resort! We had fun staying here. Rooms were very comfortable too! The guy that worked third shift was rude and didn't seem like he cared about his job. I was having problems with my key card and he just had an attitude. While the population of Wisconsin Dells is small, the city is a popular tourist destination attracting up to three million visitors each year and has been nicknamed the Waterpark Capital of the world, thanks to its high number of theme parks and water parks located here. Visually beautiful, Wisconsin Dells is a very scenic destination situated along the banks of the Wisconsin River, making it a perfect vacation spot for outdoor lovers. Most hotels in Wisconsin Dells are situated in or near one of the main theme parks or water parks. The Wisconsin Deer Park is a particularly popular area, home to a fun, family petting zoo in a unique outdoor setting. The park is also home to Buffalo, Elk, and many game birds and thus a fun destination for all the family. 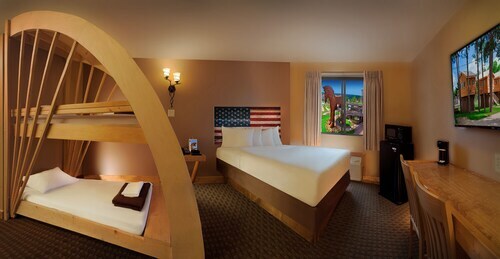 With over 100 hotels located near The Wisconsin Deer Park, it is a great part of town to stay in. Christmas Mountain is the area to stay if visiting during the winter months, home to the top ski resort in the Wisconsin Dells and a winter wonderland once snow starts to fall. While most popular in winter, the area is also includes an outstanding golf course, making it popular with visitors throughout the year. Choose from over 121 hotels nearby Christmas Mountain, ranging from 2 to 4 stars. The North Country National Scenic Trail is the best location to stay if you are looking to immerse yourself and nature and explore the beautiful scenery on offer in the Wisconsin Dells. Hike the hills and valleys of the region, past lakes, streams, and spectacular geographic features that formed thousands of years ago. Next, Mount Olympus is home to one of the best water theme parks in the Wisconsin Dells, the perfect area to stay if you are with family. It is also close to the Rick Wilcox Magic Theater and the Bigfoot Zipline tours, therefore ideal for the more adventurous souls. Hotels in Wisconsin Dells cost from . 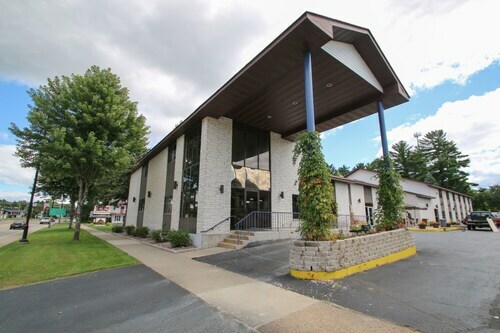 Should you be traveling on a budget, Wisconsin Dells is a great choice of destination with 67 budget 2 star hotels to choose from. In total, there are 21 4 star hotels are waiting for you. These boast amenities including multiples restaurants, unique rainfall showers, a sauna, and an in-house casino. Planning to take your four-legged friend with you on vacation? There are over 21 pet-friendly hotels in Wisconsin Dells to choose from, ensuring you do not have to leave your furry friend at home. The nearest airport to Wisconsin Dells is Dane County Regional Airport, situated 50 miles away, and just outside the city of Madison. 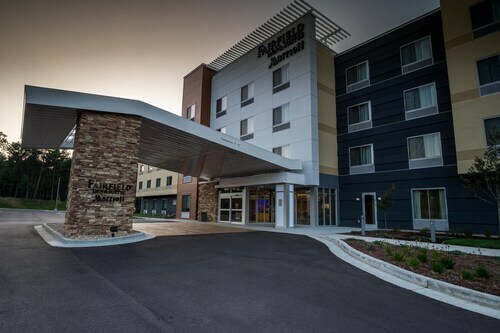 If you are looking to stay near the airport, you will be pleased to find 10 hotels nearby Dane County Regional Airport. Room was beautiful. It had light colored furniture which is a welcome change from the really dark colored furniture that everyone else has. We weren't offered the waterpark tickets that the outside sign said we would get. Clean. Close to our tournament location. Quiet and relaxing.